What does an organic farmer do? Would you make a good organic farmer? Take our career test to find out how you match with this and over 800 other careers. What is an Organic Farmer? What is the workplace of an Organic Farmer like? Organic farming is a form of agriculture that relies on crop rotation, green manure, compost and biological pest control. An organic farmer will still use fertilizers and pesticides, but strictly limits or excludes the use of synthetic fertilizers, pesticides, insecticides, herbicides, and fungicides. The expression, “feed the soil, not the plant” is a familiar refrain among organic farmers. 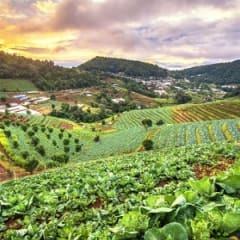 The organic farmer will also exclude livestock antibiotics, hormones, food additives, human sewage sludge, genetically modified organisms, and nanomaterials. Animals are provided with organic feed and allowed access to fresh air and the outdoors. An organic farmer produces fruits, vegetables, grains, or livestock without the use of pesticides, herbicides, or chemical fertilizers. In the case of raising livestock, certified organic feed must be used, and food additives and synthetic hormones are typically prohibited. An organic farmer has similar tasks that a regular farmer has, but in addition to the planting, tending, harvesting and attention to their livestock's health, he or she must monitor the soil conditions and make the most of the land's biological productivity. Organic farming is dependant on the quality of the soil, and farmers work to maintain and protect the viability of the land. Soil needs to be fed with organic matter, compost, mulch and manure, and the earthworm population must be carefully monitored. Crop seeds must come from certified organic stock, and livestock needs to be picked for disease and pest resistant qualities. Organic farmers need to maintain required certification, and every aspect of an organic farm needs to meet strict criteria. Each country has its own standards and regulations, therefore an organic farmer that is exporting their produce needs to meet the standards of the destination country, in addition to their own. Canada and the United States have the same standards and regulations in place, which simplifies the trading process. Strategic marketing needs to be in place in order to make a profit. An organic operation is between 25-30% more labour intensive than a standard operation, therefore organic farms need to market their products accordingly. Are you suited to be an organic farmer? Organic farmers have distinct personalities. They tend to be artistic individuals, which means they’re creative, intuitive, sensitive, articulate, and expressive. They are unstructured, original, nonconforming, and innovative. Some of them are also investigative, meaning they’re intellectual, introspective, and inquisitive. Does this sound like you? Take our free career test to find out if becoming an organic farmer is right for you. Being an organic farmer is hard work, and most of the work is done outdoors. Organic farmers care for their animals by giving them food and water, they plant and harvest crops, and they make sure their plants and animals stay healthy. They also take care of the machines that help them farm, like tractors and ploughs.